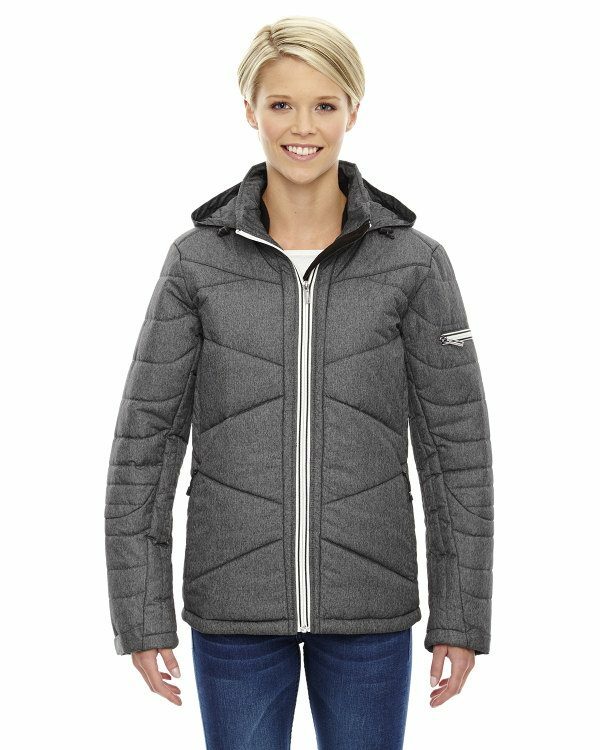 The Ash City – North End Sport Blue Ladies’ Avant Tech Mélange Insulated Jacket with Heat Reflect Technologyis available in Sizes XS-2XL. It can be purchased in your choice of the following color: Carbon Heather. SKU: AB-78698 Categories: Activewear, Carbon, Hooded Jackets, Jackets, Jackets, Ladies, Polyester Jackets, Waterproof Jackets, Women's Hoodies, Women's Clothing, Women's Jackets, Ladies Outerwear, Outerwear, Heavyweight Sweatshirts, Shop by Color Tags: heavyweight sweatshirts, hooded jackets, ladies outerwear, polyester jackets, waterproof jackets, women's clothing, women's hoodies, women's jackets Brands: Ash City. This Ash City – North End Sport Blue Ladies’ Avant Tech Mélange Insulated Jacket is completely poly Heat Reflect pongee in front panels, back sides and sleeves with water resistant which is perfect for active women.